PRODUCT: MasterKure CC 300 SB (formerly Kure-N-Seal 30), High-Gloss Concrete Sealant & Curing Agent. USDA Compliant for food areas. 5-Gallon. Price/Pail. 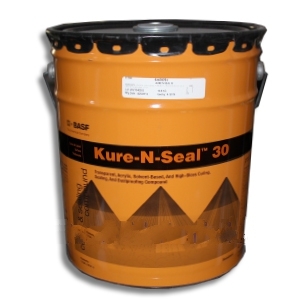 DESCRIPTION: Kure-N-Seal™ 30 is a transparent, 30% solids, solvent-based, high gloss curing acrylic curing membrane. Apply it to damp or dry concrete surfaces to provide a high-gloss finish. PACKAGING: 5-Gallon Pail. Optional 55-Gallon Drum.